Mitsuo Iso is a Japanese a freelance animator, director, and screenwriter. He was enrolled at Studio Ghibli from 1990 to 1992, where he worked on key animation for films including Ocean Waves (Umi ga Kikoeru), Only Yesterday, and Porco Rosso. Additionally, he worked on the key animation of several iconic anime television series, including Gundam 0080, Neon Genesis Evangelion (co-writer of episode 13), The End of Evangelion, Ghost in the Shell, RahXephon (writer, director, and co-animator of episode 15), FLCL, and many more. He also worked on key animation for live-action film Kill Bill Vol. 1. His attention to detail, fluid motion, and use of frames has garnered much praise and attention from animation fans and within the industry. 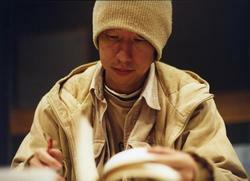 In 2007, he was the original creator, director, and screenwriter for the anime Denno Coil for which he was awarded the Excellence Award in Animation at the 2007 Japan Media Arts Festival, the TV Animation Excellence Award at the 7th Tokyo Anime Awards, the 29th Nihon SF Taisho award, the 13th Animation Kobe Individual Award, and other honors.